Online education can help instructors provide these additional learning opportunities and Lynne Prost, a faculty associate in the Department of Biochemistry, used a university professional development grant to expand her expertise in this area. Thanks to the 2018 grant through the Office of the Secretary of the Academic Staff, Prost recently completed the Professional Certificate in Online Education from UW–Madison Continuing Studies. find the learning style that works best for them. In the course, she gained more knowledge about writing course objectives and course organization, all in the context of online education. She also learned about effective online active learning opportunities and tackled important questions in online education. How do you maintain instructor presence in an online space? How can students be both independent and collaborative online? 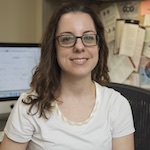 Prost teaches Biochem 551: Biochemical Methods with faculty members Alessandro Senes in the fall and Vatsan Raman in the spring, and she also co-teaches Biochem 100: Biochemistry First-Year Seminar with faculty associate Mario Pennella. She considers 551 a “blended” course that mixes in online content with a lecture and lab. It is the capstone course required for all biochemistry majors. Students view online material, attend an in-person class that incorporates active learning, and then get hands-on experience in the lab. The in-person class for 551 covers the biological concepts behind the laboratory experiments and often demonstration videos prepare the students for the lab portion. Through the certificate, Prost learned how all of this material can be better integrated with course objectives. Biochemical Methods is meant to give students an idea of what being a biochemist is like by having them follow a research project they carry out throughout the semester. Along with laboratory techniques, students get experience in scientific communication through written and oral assignments and presentations.